This third-grade how-to essay attempts to explain folding an origami box. Learn more about writing assessment. You can make a blow-up box out of a square piece of paper. Fold it diagonal. Then open it and fold it diagonal the other way. Then pop up the middle and fold it down like a roof. Now you fold the sharp corners up to the top of the roof. Then you fold the sharp corners down to tuck in the little pocket. You blow it up and walla you have a box! 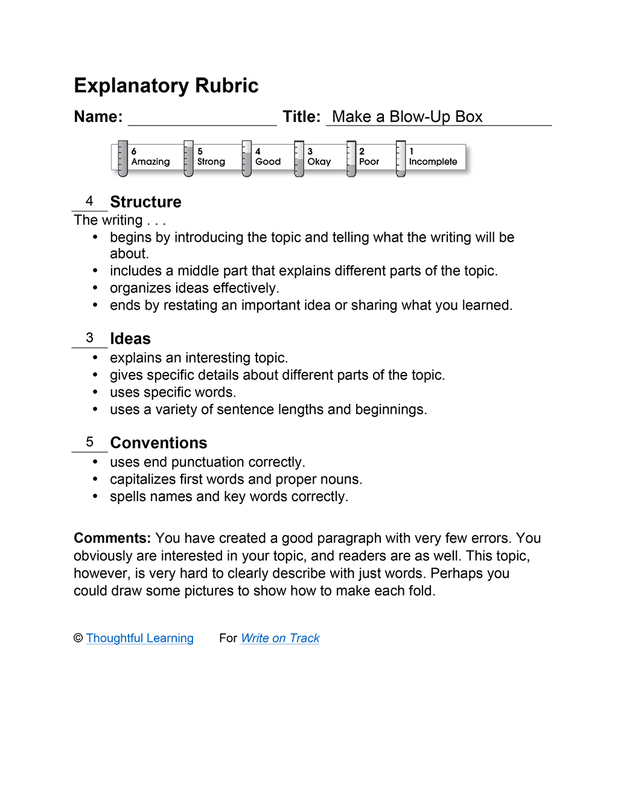 Make a Blow-Up Box by Thoughtful Learning is licensed under a Creative Commons Attribution-NonCommercial-ShareAlike 4.0 International License. Based on a work at k12.thoughtfullearning.com/assessmentmodels/make-blow-box.